V Construction of Road Under Bridge by Box Pushing technique Nr. 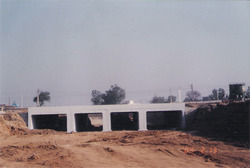 Bijwasan Railway Station on Delhi – Rewari Section of Northern Railway. This RUB is constructed to connect Two N. H. i.e. N.H. 24 Nr. Najatgarh & N.H. 8 Nr. Mitti on Bhadreshwar-Mundra Road, Kutch. (1996-1997) 79, 78, 386 Rs. 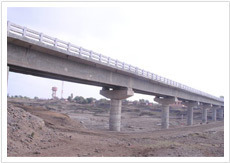 Construction of Rail Over Bridge and its approaches near village Nardana on Mumbai-Agra Road National Highway No.3 and strengthening the existing two lane pavement from Tapi Bridge in Dhule district, Maharahstra under Built, Operate, Transfer (BOT) basis - Project Management, Quality Assurance, Progress Monitoring and Cost Control.